This shield inspired mirror will make a regal impact on your home decor. 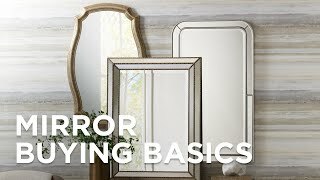 A unique mirror that will bring a special style to your wall. Shaped like a shield, this tantalizing wall mirror has a frame of mirrored glass, giving it added heft. A sure-fire winner in the never ending quest for exciting home decor. Overall: 24" wide x 32" high x 1 1/2" deep. Hang weight is 16 lbs. 12 1/2" wide at the top x 17 3/4" wide at the bottom middle x 9" wide at the bottom. Glass only section is 18" wide x 26 1/2" high. Wall mirror from the Cooper Classics Nouveau Mirror collection. All glass finish. Urethane frame material. In a regal navy finishthe stunningflourish-adorned silhouette of this oval wall mirror pops.